We covered a few girls gifts in our Hasbro toys for Girls however what about the little guy in your life? There are so many great toys out there. We are happy Hasbro has it all covered from learning to just plain old fashion having fun. Our little guy is an official "Preschooler" he is three now, almost potty trained and ready to take on the world next fall in jr. kindergarten. He does share his sisters toys however there is nearly a four year age gap between them so a lot of the toys our daughter receives are too advanced for him, are fragile for little hands to handle or contain small parts which can pose a choking hazard to younger kids. We want to give him something he can enjoy. A great idea to start him off on the right path would be a learning toy. What better than his very own talking robot? You do remember Alphie don't you? He taught us our ABC's and 123's back when we were kids and now, with an updated version, Alphie is available for our children to enjoy! When I saw that Hasbro Canada still offered Alphie we had to take a look at him for our little guy who is a huge fan of anything robots! Now more lifelike than ever before, Alphie sports an LCD screen to facial expressions, has a friendly childlike voice, and a playful, curious personality making Alphie robot not just a learning to but a beloved buddy. Along with his animated personality, which children will just love, this new modern Alphie friend from PlaySkool features important educational activities that help develop early learning skills in toddlers and preschoolers. With Alphie leading the way, preschoolers can learn the alphabet, rhyming, counting, colours and shape recognition, matching, animal names, instrument sounds and so much more! The new and improved Alphie learning companion has a sleek new look and convenient carrying handle. He comes with thirty double-sided cards that contain over 350 fun activities. Our Canadian version of Alphie emphasises our pronunciation of the letter "Z" as well as our spelling of the word "colour" - not to confuse any little Canadians! Alphie requires three "AA" batteries which are included! I think PlaySkool Alphie has always been a good choice when introducing your younger ones to new learning toys. He is super friendly and quirky, his voice is clear and easy to understand as he talks like a robot. 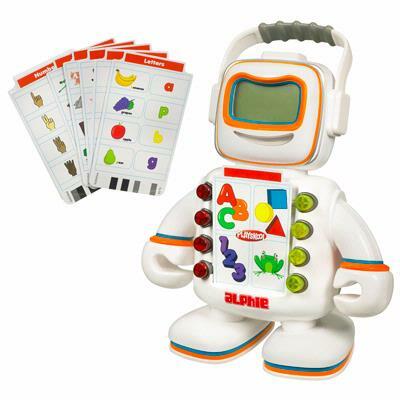 I'm sure Alphie will be a hit with many preschoolers this holiday season including our little guy! Our little guy is a huge fan of the Chuck and Friends television series, he absolutely loves anything to do with cars and trucks. Chuck the truck is an enjoyable animated dump-truck, the series is about Chuck and his friends and it teaches lessons about friendship and problem solving. As a mom I think it's a great idea to introduce Chuck and Friends to the little racer in your life. 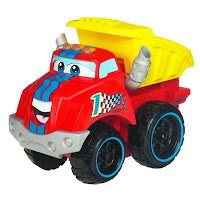 Tonka Chuck and Friends Race Along Chuck is going to be a hit this holiday season, he moves and races around, great fun for the little guy! Dad is a big influence when it comes to our son and of course, like father like son our little guy loves Transformers. His two favourite things in one, robots and cars. I'm not talking the movies either, the two of them will sit and watch the cartoon together when it airs on tv, it's so cute! It brings back memories for my hubby and makes new ones for him and our son. Little guy has a couple of Transformers toys but he didn't have a playset, until now. Hasbro has a great assortment of Transformers play sets. Little guy is going to be thrilled, a playset themed with his favourite AutoBot, Bumblebee! The Rescue Bots are getting tuned-up and ready to roll out of the Bumblebee Rescue Garage this holiday season! 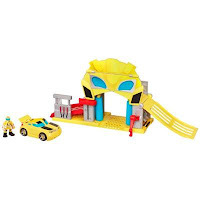 Bumblebee designed his garage himself to quickly change into a rescue station when disaster strikes, so that the Rescue Bots are always ready to save another day! The Bumblebee Rescue Garage is a rescue station in disguise! The Axel Frazier figure can drive bumblebee through the car wash rollers as they rotate or use the towing hook to tow another vehicle that needs repairing (extra vehicles are sold separately). There is a lift that moves up and down to help move the cars around for repair. The Bumblebee vehicle even has a hidden robot underneath, stand it up to see it! Posted by AME on behalf of Hasbro Canada. Product was received for review purposes however opinions and comments on this blog are always authentic and those of the author. We would like to thank Hasbro Canada for partnering to give one lucky AME reader the chance to win all these prizes. Congrats to the winner! I shop well in advance but I always end up picking up some last minute items as well. I shop very early. I have already started Christmas shopping. I plan ahead, I think I should start making some lists. Great ideas here! I'd love to win this for my nephews for their Christmas gifts! I shop in advance, but find it harder to find gifts for boys for some reason. I try to be prepared ahead of time,but there is always some last minute shopping to be done! I try to get prepared ahead of time. I always look for deals, and then buy things and put them in the closet for when needed! I'm a last minute shopper. I used to shop last minute but the last couple years I shop throughout the year when I find things on sale. I do both! I always pick up things that I know would be great gifts when I see them on sale, but when it's someone who's hard to buy for, I usually leave it last minute! Thank you so much! Just picked this up today and will be taking some down to be donated to kids in need once the holiday boxes are out!